Australians of all political persuasions have every reason to be proud of the newly-issued Defence White Paper. It lays out a logical, well-reasoned and broadly supportable articulation of the strategic environment likely to develop in the region over the next two decades, and prescribes a deliberate and achievable course of action to protect Australia’s interests well into this century. Critics may fault the relatively short shrift given to the cyber domain, as well as potential messaging flaws  involved in its release, but there’s little else of which to complain. As an American and a serving US Army officer, I think there’s much to admire in both process and product. The US process is much more fragmented and, consequently, less coherent than the one used to produce the 2016 Defence White Paper. Our Defense Strategy Review (formerly the Quadrennial Defense Review), mandated at four-year intervals, ultimately has less influence on national defence strategy and policy than the annual debates over the budget. At just 64 pages, the 2014 QDR report is less a plan of action than a restatement of principles written in such bland language that supporters of contradictory programs or policies can both find justification for their positions in its pages. Aside from the QDR, intermittent ‘strategic guidance’ documents from the Secretary of Defense and the uniformed service chiefs, and the appropriately named ‘posture statements ’ provided to the Congress, muddy the waters even further. The combined result is a system so encumbered by a layered bureaucracy that real debate seldom occurs. Even when it does, it’s almost always conducted by proxies—professional staffers serving the House of Representatives and Senate, policy experts, and lobbyists for defence industries, some of whom approach the problem with their eyes less focused on value for money than on monetary return on investment. In contrast, Australians have enough detail in the new White Paper to comprehend the government’s proposals. A thorough reading gives the average voter sufficient grasp of the issues to make an informed decision on whether to ask his or her elected representative to support this plan or not. Especially appealing are the costing processes, investment strategy and industrial policy statement that support the current White Paper. Together they demonstrate a remarkable commitment to ‘getting it right’ in the long term. In today’s fractious political environment, Americans can only watch on with envy. I’m particularly pleased to see the DWP’s robust commitment to the US–Australia relationship. That’ll be especially valuable if the declaration on increased international engagement is put into practice to achieve our common interests in the region and globally. I’m also encouraged by the White Paper’s full-throated acknowledgment that Australia’s military forces constitute an additional line of effort for diplomacy. The US has long used its military forces in that role, in ways that complement or even anticipate the more traditional diplomatic efforts of our State Department. Regionally, I welcome the prospect of greater Australian participation in activities alongside and in addition to those of the US Pacific Command, particularly vis-à-vis continued Chinese provocations in the South China Sea. 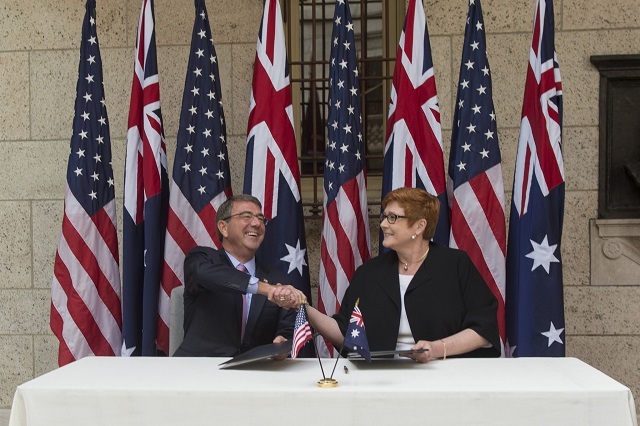 I also look forward to increased opportunities for US ground, air and naval forces to interact with the ADF through more frequent exercises and a more robust personnel exchange program. It’d benefit both forces to expand those exchanges to include command billets, as the US now does with the UK and Canada. The ADF now provides an Army Major General to US Army Pacific as a deputy commander; a reciprocal billet for a US officer within the Australian Army would be a welcome first step. I’m not naïve enough to believe that all provisions of the White Paper will be implemented without resort to discussion, modification and compromise. I do hope, however, that the activist spirit of this White Paper, one that recognises the criticality of defending Australian interests starts beyond the nation’s beaches, won’t be sacrificed on the altar of political expediency. Such an outcome would set the ADF and Australia onto a wrong path, one that leads to economic stagnation and military irrelevance. Australians have been well-served by the all those inside and outside of government who developed the 2016 Defence White Paper. Its tone and contents fully justify the long lead time required to bring it to fruition. Tom Hanson, a colonel in the US Army, is the US Pacific Command Visiting Fellow at the ASPI. The views he expresses are his own and do not reflect the official positions of the US Pacific Command, the US Department of Defense or the US Government. Image courtesy of the US Department of Defense.